Join us this Easter Saturday for a fun-packed day with games and activities for the whole family to enjoy. Activities start from 12pm to 3pm, and include a city-wide Easter Egg Hunt with a prize for each find, face painting, raffles, a magic show and more. 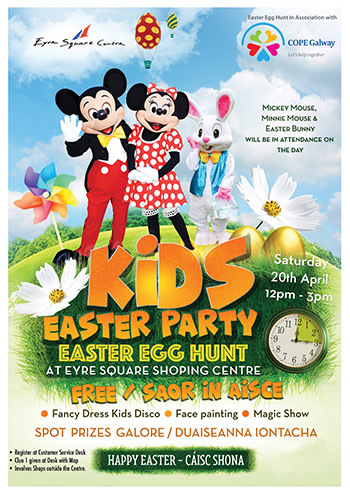 The event is free and organised by Eyre Square Shopping Centre and COPE Galway. Donations to support our services in Galway are welcome. A special thank you to the amazing local businesses who have helped sponsor this event. Kerr Sherry Ryan Accountants; Kirby Engineering and Construction; The Village Salthill; Helena McElmeel Architects; EasyFix Galway; Colas Galway; Café Temple; Burke Insurances; Monami Construction; O’Toole Transport; C&L Industrial; Carabay Packaging; Winters Property Management; OMS Office Machine Solutions; McCarthy Keville O’Sullivan. Take part in a fundraising event or plan your own community fundraiser. Volunteer your time and skills to help us provide essential services. Make a monthly or once off donation to support our services. Corporate volunteer teams help our services with practical projects.